Aliases I wanna be your everything, スノー・ラディッシュ・バケーション!! 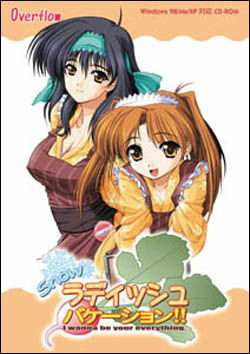 Snow Radish Vacation is the prequel to Summer Radish Vacation 1 and 2 and as such, also of School Days. Chronologically, it is the first in the "Radish continuity." 2001-12-28 18+ Snow Radish Vacation!! "Naturally, my hands got sticky from the oil... but I'm a man and therefore don't care!"